P.S All pictures are taken from the manual itself. Upon connecting to a wireless or wired internet network, an authentication dialog will pop up requesting the user to enter a password. If the user fails to enter the correct password within the pre-defined timing, hidden alerts and information* (see Technical) will be sent out to any pre-defined email address(es)! “Verey I will send out alerts together with other important information; IP addresses, machine serial number, MAC Hardware Address and even details of nearby wireless networks out immediately! IP Address does nothing in helping you find where your Laptop is (yourself that is), machine serial number and mac hardware address just helps you fill in a form at the police center and lastly the details of nearby wireless networks are just gimmicks to fill out the email that is sent to you. 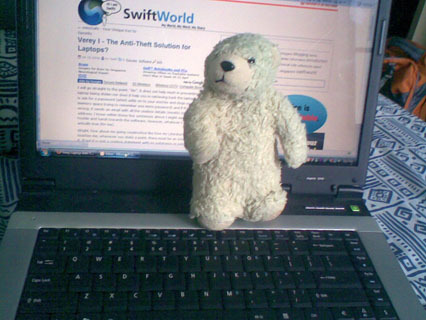 It is like, okay I know the person taking my laptop is connected to a wireless network called “SwiftWorld”, now where on earth (alright let say Singapore), is there a wireless network SwiftWorld? Bugis, Hougang? Changi? Jurong? Practically information that is not needed. About the IP Address, well perhaps if you file in a report to the police with the IP address, mac hardware address etc the police might be able to find it. Just MIGHT. However, I believe that the chances of your laptop being returned or found are still extremely slim whether you have or not the software. Of course verey increases the percentage of success but just a little. If you have any comments please, comment. I don’t see how my review is biased in anyways and I still stand firmly on the thinking that it does help, but not much at all, find back lost/stolen laptops. My bad if it offends anyone, I do agree the post is kind of exaggerated how bad it is, replace and rephrased the english a little bit so as to make it much less exaggerating. Haha, don’t worry, you make a lot of sense. In reality, that is the sad truth. All it does is do its part to aid us in any laptop recovery. But I wonder if the police is able to trace the IP address? Not too sure also. Plus IP address changes all the time. I guess it’s just a little bit of help? As long as the culprit and laptop is in Singapore, with Verey I, I believe it increases the chance of nabbing the culprit with the IP address. With the IP address and time of use, the police is able to get the identity of the internet account holder by checking with the respective ISP (internet service providers). With more IP addresses being emailed when the culprit connects to the Internet at different time, the culprit’s identity will eventually be determined. Eventually? Hmm I would say it would be a long time. And if the culprit were to reformat the computer or like what I said in the post (and ignorantsoup just said) do not log into the internet at all, the laptop is good as gone. Of course there aren’t much other alternatives for anti-theft softwares etc, but I guess for now prevention is better than cure. Besides the price tag is kinda heavy you know. If you want the freeware,you can use laptoplock. OK, So I get the IP address, yes I can track the criminal down, get sweet revenge. I am sure if it is stolen with a lot of private information (government, business etc) it would be worth it. But now lets look and think outside the square, which a lot of reviewers and peoples comments fail to do. Ok, they do not connect to internet so you do not get details sent to you. But the system still locks out the thief, he restarts, again locks up the computer. How annoying, so he replaces the hard drive or re-formats it. I do not get my computer back, but he has also just erased all my personnal and confidential information that he cannot use now. Most people are upset on losing a computer, not for the inconvenience, but mainly for the personnal stuff on it. Insurance covers a replacement, but you worry about seeing your personnal stuff on you tube or someone using your information for cyber crime and identity theft. So i think it is worth the price tag. And NO, I do not have it YET!!! Be more open minded about your reviews huh, not just stating the obvious. You dont need to replace the hard drive. Just reformatting. If the thief actually wants to use your private information, they don’t actually have to reformat the computer and lose all the data at the same time. They would first transfer the files out first into their external hard disk and then reformat the computer. Seriously, if the thief were to actually want to get your data, Verey does nothing in stopping it indirectly or directly. Besides, you can just uninstall Verey with just a few clicks. Oh and one more thing, you got it all wrong. Verey doesn’t lock the computer. Get your facts right. You thought out of the box, but still the fundamentals are important. I’m also in the view that in the current day and age, the chance of the stolen laptop logging onto the Internet is pretty high. Whether the software is expensive is subjective. Obviously the person who finds the software price reasonable will buy it and vice versa. Do you find a $2k LV bag that has the same function as any other bags expensive? Obviously many don’t. Just look at the queue outside LV boutique on weekends. Granted, the software is not failproof. But if it is, it won’t be only $39.90! LOL!